Danny Pearson, is a writer and editor of children’s books and the Beano. Like me, he grew up in Hitchin and he had the idea that there should be a Hitchin Children’s Book Festival. When he suggested the idea on Twitter, I agreed wholeheartedly. Hitchin is full of young families, so a children’s book festival would be a perfect fit. I jumped at the chance to be a part of it! Danny set about organising the festival and contacting a couple more local authors and illustrators. Although we initially hoped for a trio, one author/illustrator who was interested had to drop out due to an event scheduled by his publisher. 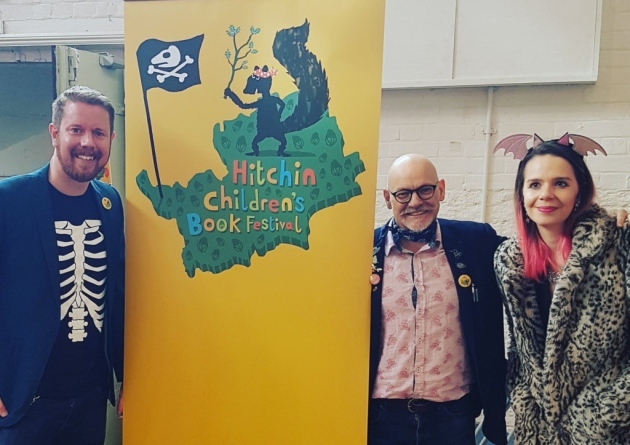 Fortunately, my former tutor, the brilliant James Mayhew was also fully behind the idea of a Hitchin Children’s Book Festival and able to commit. I wrote a little here about how James was a great influence in my becoming a children’s book author and illustrator. I was excited to share the news straight away after, but we decided to co-ordinate a reveal in September so it would have the most impact. Local illustrator/designer, Dan Bramall designed the logo for the festival. Then Danny and his girlfriend put together the official poster for the festival. Here’s one in the window of Fabios gelato. There’s an ice cream covering my face, but at least it’s a pink one. Hitchin library put together this wonderful promotional display. As this was the first Hitchin Children’s Book Festival, the idea was that it would be a launch platform for future festivals. We agreed to limit the tickets to 60 to keep it manageable. These actually ended up selling out a full month before the festival, just through social media promotion. It seems like a Children’s Book Festival was exactly what Hitchin wanted! OUP sent Isadora Moon bookmarks, and Hachette sent Katie postcards for James Mayhew’s series. Danny arranged the HCBF ‘business cards’. Danny started the day with a cup of tea to get some warmth on his bones. There were even some great Hitchin Children’s Book Festival pin badges. The rooms were a great size for an intimate event, and the desks made it easy for attendees to practise their drawing. We did a ‘what magical creature are you?’ quiz. One audience member came out as a Vampire Wizard hybrid. Here I am drawing her in the Isadora Moon style. This little girl had brought some excellent Isadora Moon drawings of her own to show me. …and we got a photo by the big Hitchin Children’s Book Festival sign. For a first go at a book festival for children in Hitchin, it ran very smoothly and seemed to be enjoyed by everyone. This was down entirely to the efforts of everyone who helped bring it to life, all of whom helped out as volunteers. We also came away with two of James Mayhew’s latest books. I wanted Katie and the Starry Knight and Henry really liked The Knight Who Took All Day. We bought both! Celestine got two books signed to her by a REAL LIFE AUTHOR! James was even kind enough to give us / Celestine the illustration he created in his event. Henry loves knights and dragons, so he was really pleased with it. He’s framed it and put it up in Celestine’s room. Celestine appreciates original artwork too! Don’t forget that you can keep up with my latest work and news on my facebook page, Twitter and Instagram. Happy (belated) Halloween, Isadora Moon!